Myofibrillar myopathy (MFM) is a group of rare genetic disorders that cause both skeletal and cardiac muscle weakness. Mutations in the Bcl2-associated Athanogene 3 (Bag3) protein, highly expressed in striated muscle, are reported to cause a particularly severe form of MFM. As a small heat shock protein, Bag3 functions to maintain structural support and protein quality control processes within muscle cells. In contrast, mutant Bag3 leads to progressive cardiac and skeletal muscle weakness by unknown mechanisms. To date, more than ten mutations in Bag3 have been reported to result in MFM, many with particularly severe phenotypes affecting cardiac muscle. The most frequently published Bag3 mutation is a Proline-209-Leucine (P209L) mutation, which results in a severe childhood onset form of MFM with cardiomyopathy. To delineate how the Bag3 P209L mutation causes cardiomyopathy in patients, we generated a transgenic mouse model (Bag3-P209L Tg+ mice) expressing human Bag3-P209L exclusively in cardiomyocytes. Fig. 1. Cardiomyocyte changes caused by human Bag3-P209L expression in Bag3-P209L Tg+ mice. A. Normal, healthy cardiomyocytes display healthy mitochondria and proper cytosolic localization of wildtype Bag3 with no detection of pre-amyloid oligomers (PAOs). B. At 12 months of age, cardiomyocytes with Bag3-P209L expression display cardiomyocyte hypertrophy, increased fibroblast area (number and/or size), decreased wildtype Bag3 levels, increased mitochondrial fragmentation (and smaller mitochondria), PAOs, increased fibroblast presence, and a systolic/diastolic cardiac dysfunction (heart failure) phenotype. These Bag3-P209L Tg+ mice begin to display cardiac dysfunction by eight months of age, with progressively declining cardiac function through 12 months of age without any mortality. 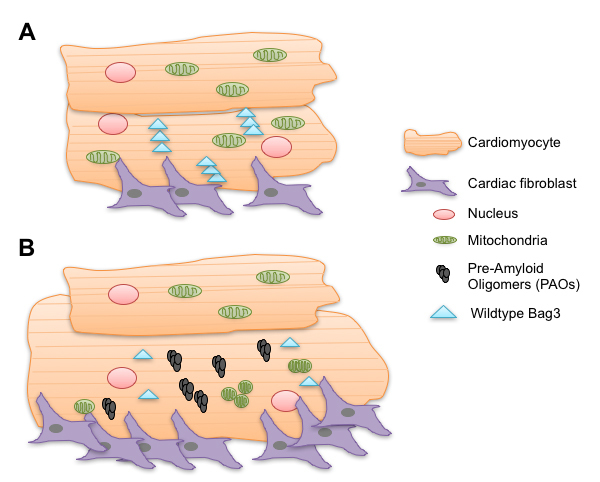 At the cellular level, we identified deficits and remodeling consistent with known hallmarks of a failing heart, including cardiomyocyte enlargement (hypertrophy), mitochondrial dysfunction, altered metabolism, and increased cardiac fibroblast presence (Fig. 1). Furthermore, we discovered down-regulation of normal Bag3 in the presence of the mutated Bag3 in Bag3-P209L Tg+ mice. Collectively, these data reveal a dilated cardiomyopathy phenotype comparable to human disease. We know little about the mechanisms driving cardiomyopathy in patients with known genetic causes of MFM, including the Bag3-P209L mutation. A common feature of these diseases is the presence of misfolded proteins, called pre-amyloid oligomers (PAOs) within muscle cells. PAOs are soluble misfolded intermediates in the formation of large aggregates within cells. Experimental and clinical evidence indicates that PAOs are cytotoxic (injure and kill cells), mechanistically contributing to the pathophysiology of common neurodegenerative diseases, including Alzheimer’s and Parkinson’s disease. In our studies, we identified that mutant Bag3-P209L expressed in cardiomyocyte accumulate to form PAOs at one year of age. Thus, we hypothesized that the cardiac Bag3-P209L PAOs mechanistically were causing the progressive development of cardiac dysfunction paralleling the underlying mechanisms hypothesized in Alzheimer’s and other neurodegenerative disorders, where PAOs induce neuronal dysfunction and death directly. In the pathogenesis of neurodegenerative diseases, PAOs have been hypothesized to activate p38 MAPK signaling, to initiate cell damage and death. Inhibition of p38 has shown therapeutic potential to reverse neuronal proteotoxicity, including p38 inhibitors, which are currently in clinical trials to treat Alzheimer’s disease (clinicaltrials.gov identifiers: NCT02423200, NCT02423122). We hypothesized that p38 is increased in the hearts of Bag3-P209L Tg+ mice to drive cardiomyocyte damage and the onset of cardiomyopathy. When we interrogated Bag3-P209L Tg+ hearts at one year of age, we identified significant activation of p38, simultaneously with systolic and diastolic dysfunction in vivo. This led us to propose a disease model in Bag3-P209L Tg+ mice that parallel the well-defined pathogenesis in neurodegenerative diseases (Fig. 2). Bag3-P209L misfolds within cardiomyocytes resulting in PAO formation and a subsequent increase in activated p38. This increase in activated p38 results in muscle cell death and cardiac dysfunction. Furthermore, Bag3-P209L may interact directly with p38 to increase activated p38 levels, contributing to continued disease progression. Fig. 2. Proposed mechanism of cardiomyopathy caused by the Bag3-P209L mutation within cardiomyocytes. A. The P209L mutation is a point mutation resulting in a single amino acid change in the structure of Bag3. B. The Bag3-P209L expression causes PAO formation within cardiomyocytes. Cytotoxic PAOs activate stress signaling through an increase in activated p38 resulting in cell death and cardiac dysfunction. These findings characterize the first preclinical model for Bag3-related MFM and identify a potential mechanism contributing to disease resulting from a Bag3-P209L mutation. 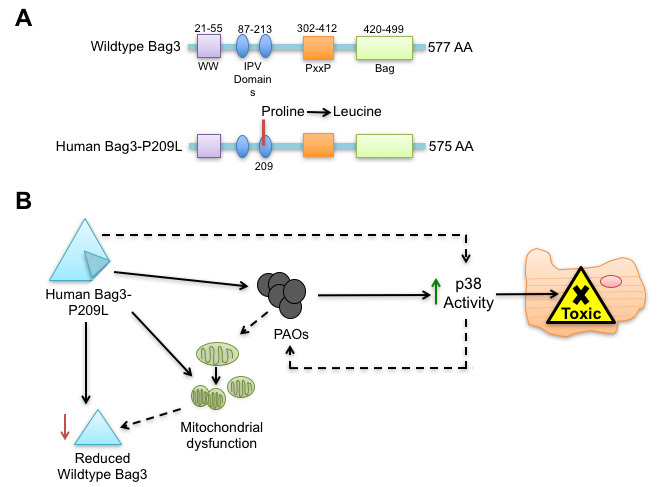 Importantly, these data identify p38 as a potential target for therapeutic intervention for Bag3-related MFMs for which no treatments currently exist.